The Academy Awards or the Oscars is an annual American awards ceremony honoring cinematic achievements in the film industry. The various category winners are awarded a copy of a statuette, officially the Academy Award of Merit, which is better known by its nickname Oscar. The awards, first presented in 1929 at the Hollywood Roosevelt Hotel, are overseen by the Academy of Motion Picture Arts and Sciences (AMPAS). The awards ceremony was first televised in 1953, and is now seen live in more than 200 countries. The Oscars is the oldest entertainment awards ceremony; its equivalents, the Emmy Awards for television, the Tony Awards for theatre, and the Grammy Awards for music and recording, are modeled after the Academy Awards. The 86th Academy Awards ceremony was held on March 2, 2014, at the Dolby Theatre in Los Angeles, later than usual as to not clash with the Winter Olympics in Sochi, Russia. The 87th Academy Awards ceremony was held on February 22, 2015. Historically given during the first quarter of the new year, the awards honor achievements for cinematic accomplishments for the preceding year. For example, 12 Years a Slave was awarded Best Picture for 2013, although the Oscar ceremony was conducted in 2014. As of the 87th awards ceremony, a total of 2,947 Oscars have been awarded since the inception of the award. The first Academy Awards presentation was held on May 16, 1929, at a private dinner at the Hollywood Roosevelt Hotel with an audience of about 270 people. The post-awards party was held at the Mayfair Hotel. The cost of guest tickets for that night's ceremony was $5 ($69 in 2016 dollars). Fifteen statuettes were awarded, honoring artists, directors and other participants in the film-making industry of the time, for their works during the 1927–28 period. The ceremony ran for 15 minutes. Winners had been announced to media three months earlier; however, that was changed for the second ceremony in 1930. Since then, for the rest of the first decade, the results were given to newspapers for publication at 11:00 pm on the night of the awards. This method was used until an occasion when the Los Angeles Times announced the winners before the ceremony began; as a result, the Academy has, since 1941, used a sealed envelope to reveal the name of the winners. Although there are seven other types of annual awards presented by the Academy (the Irving G. Thalberg Memorial Award, the Jean Hersholt Humanitarian Award, the Gordon E. Sawyer Award, the Academy Scientific and Technical Award, the Academy Award for Technical Achievement, the John A. Bonner Medal of Commendation and the Student Academy Award) plus two awards that are not presented annually (the Special Achievement Award in the form of an Oscar statuette and the Honorary Award that may or may not be in the form of an Oscar statuette), the best known one is the Academy Award of Merit more popularly known as the Oscar statuette. Made of gold-plated britannium on a black metal base, it is 13.5 in (34 cm) tall, weighs 8.5 lb (3.85 kg) and depicts a knight rendered in Art Deco style holding a crusader's sword standing on a reel of film with five spokes. The five spokes represent the original branches of the Academy: Actors, Writers, Directors, Producers, and Technicians. Oscar.com—official Academy Award ceremony site. "Oscar Greats" at Time magazine. ^ Never Say Never: Academy Awards move to Sunday The Item – 19 March 1999. Google News Archive. It has become a tradition to give out gift bags to the presenters and performers at the Oscars. In recent years these gifts have also been extended to award nominees and winners. The value of each of these gift bags can reach into the tens of thousands of dollars. In 2014 the value was reported to be as high as US$80,000. The value has risen to the point where the U.S. Internal Revenue Service issued a statement regarding the gifts and their taxable status. Oscar gift bags have included vacation packages to Hawaii and Mexico and Japan, a private dinner party for the recipient and friends at a restaurant, videophones, a four-night stay at a hotel. Watches, bracelets, vacation packages, spa treatments, bottles of vodka, maple salad dressing, and weight-loss gummie candy. Some of the gifts have even had a "risque" element to them; in 2014 the adult products retailer Adam & Eve had a "Secret Room Gifting Suite". Celebrities visiting the gifting suite included Judith Hoag, Carolyn Hennesy, Kate Linder, Chris Mulkey, Jim O'Heir, and NBA star John Salley. The 25th Independent Spirit Awards (in 2010), usually held in Santa Monica the Saturday before the Oscars, marked the first time it was moved to a Friday and a change of venue to L.A. Live. The annual "Night Before," traditionally held at the Beverly Hills Hotel, begun in 2002 and generally known as the party of the season, benefits the Motion Picture and Television Fund, which operates a retirement home for SAG actors in the San Fernando Valley. Elton John AIDS Foundation Academy Award Party airs the awards live at the nearby Pacific Design Center. The Governors' Ball is the Academy's official after-party, including dinner (until 2011), and is adjacent to the awards-presentation venue. In 2012, the three-course meal was replaced by appetizers. The Vanity Fair after-party, historically at the former Morton's restaurant, since 2009 has been at the Sunset Tower. Acting prizes in certain years have been criticized for not recognizing superior performances so much as being awarded for sentimental reasons, personal popularity, atonement for past mistakes, or presented as a "career honor" to recognize a distinguished nominee's entire body of work. Typical criticism of the Academy Awards for Best Picture is that among the winners and nominees there is an over-representation of romantic historical epics, biographical dramas, romantic dramedies, and family melodramas, most of which are released in the U.S. the last three months of the calendar year. The Oscars have been infamously known for selecting specific genres of movies to be awarded. From 1927 to 2001 around 49% of Best Picture nominated films had been categorized as a drama and out of the 432 films to be analyzed within that time 47% of the winning films were in fact dramas. This has led to the coining of the term 'Oscar bait', describing such movies. This has led at times to more specific criticisms that the Academy is disconnected from the audience, e.g. by favoring 'Oscar bait' over audience favorites, or favoring historical melodramas over critically acclaimed movies that depict current life issues. In addition, some winners critical of the Academy Awards have boycotted the ceremonies and refused to accept their Oscars. The first to do so was Patton) at the 43rd Academy Awards ceremony. Scott described it as a 'meat parade', saying 'I don't want any part of it." The third was Marlon Brando, who refused his award (Best Actor for 1972's The Godfather), citing the film industry's discrimination and mistreatment of Native Americans. At the 45th Academy Awards ceremony, Brando sent Sacheen Littlefeather to read a 15-page speech detailing his criticisms. Due to the positive exposure and prestige of the Academy Awards, studios spend millions of dollars and hire publicists specifically to promote their films during what is typically called the "Oscar season". This has generated accusations of the Academy Awards being influenced more by marketing than quality. William Friedkin, an Academy Award-winning film director and former producer of the ceremony, expressed this sentiment at a conference in New York in 2009, describing it as "the greatest promotion scheme that any industry ever devised for itself". Another award, entitled the Academy Award for Best Original Musical, is still in the Academy rulebooks and has yet to be discontinued. However, due to continuous insufficient eligibility each year, it has not been awarded since 1984 (when Purple Rain won). In the first year of the awards, the Best Directing award was split into two separate categories (Drama and Comedy). At times, the Best Original Score award has also been split into separate categories (Drama and Comedy/Musical). From the 1930s through the 1960s, the Art Direction (now Production Design), Cinematography, and Costume Design awards were likewise split into two separate categories (black-and-white films and color films). Prior to 2012, the Production Design award was called Art Direction, while the Makeup and Hairstyling award was called Makeup. In 2002, the Dolby Theatre (formerly known as the Kodak Theatre) became the current venue of the presentation. 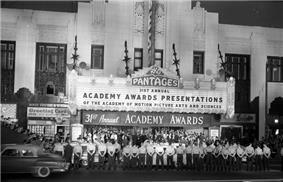 From 1950 to 1960, the awards were presented at Hollywood's Pantages Theatre. 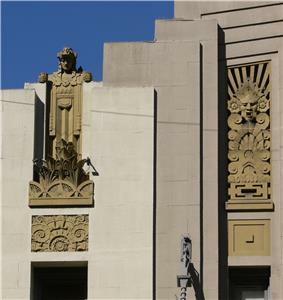 With the advent of television, the awards from 1953 to 1957 took place simultaneously in Hollywood and New York, first at the NBC International Theatre (1953) and then at the NBC Century Theatre, after which the ceremony took place solely in Los Angeles. The Oscars moved to the Santa Monica Civic Auditorium in Santa Monica, California in 1961. By 1969, the Academy decided to move the ceremonies back to Los Angeles, this time to the Dorothy Chandler Pavilion at the Los Angeles County Music Center. By contrast, ceremonies honoring films that have not performed well at the box office tend to show weaker ratings. The 78th Academy Awards which awarded low-budgeted, independent film Crash (with a pre-Oscar gross of US$53.4 million) generated an audience of 38.64 million with a household rating of 22.91%. In 2008, the 80th Academy Awards telecast was watched by 31.76 million viewers on average with an 18.66% household rating, the lowest rated and least watched ceremony to date, in spite of celebrating 80 years of the Academy Awards. The Best Picture winner of that particular ceremony was another independently financed film (No Country for Old Men). Historically, the "Oscarcast" has pulled in a bigger haul when box-office hits are favored to win the Best Picture trophy. More than 57.25 million viewers tuned to the telecast for the 70th Academy Awards in 1998, the year of Titanic, which generated close to US$600 million at the North American box office pre-Oscars. The 76th Academy Awards ceremony in which The Lord of the Rings: The Return of the King (pre-telecast box office earnings of US$368 million) received 11 Awards including Best Picture drew 43.56 million viewers. The most watched ceremony based on Nielsen ratings to date, however, was the 42nd Academy Awards (Best Picture Midnight Cowboy) which drew a 43.4% household rating on 7 April 1970. The Academy has contemplated moving the ceremony even further back into January, citing TV viewers' fatigue with the film industry's long awards season. However, such an accelerated schedule would dramatically decrease the voting period for its members, to the point where some voters would only have time to view the contending films streamed on their computers (as opposed to traditionally receiving the films and ballots in the mail). Also, a January ceremony would have to compete with National Football League playoff games. After many years of being held on Mondays at 9:00 pm Eastern/6:00 p.m Pacific, in 1999 the ceremonies were moved to Sundays at 8:30 pm Eastern/5:30 pm Pacific. The reasons given for the move were that more viewers would tune in on Sundays, that Los Angeles rush-hour traffic jams could be avoided, and that an earlier start time would allow viewers on the East Coast to go to bed earlier. For many years the film industry had opposed a Sunday broadcast because it would cut into the weekend box office. After more than 60 years of being held in late March or early April, the ceremonies were moved up to late February or early March starting in 2004 to help disrupt and shorten the intense lobbying and ad campaigns associated with Oscar season in the film industry. Another reason was because of the growing TV ratings success of the NCAA Men's Division I Basketball Championship, which would cut into the Academy Awards audience. The earlier date is also to the advantage of ABC, as it now usually occurs during the highly profitable and important February sweeps period. Some years, the ceremony is moved into early March in deference to the Winter Olympics. Another reason for the move to late February and early March is to avoid the awards ceremony occurring so close to the religious holidays of Passover and Easter, which for decades had been a grievance from members and the general public. Advertising is somewhat restricted, however, as traditionally no movie studios or competitors of official Academy Award sponsors may advertise during the telecast. The Awards show holds the distinction of having won the most Emmys in history, with 47 wins and 195 nominations. The Academy Awards is the only awards show that is televised live in all United States time zones (excluding Hawaii; they aired live in Alaska starting in 2011 for the first time since 1996), Canada, the United Kingdom, and gathers millions of viewers elsewhere throughout the world. The 2007 ceremony was watched by more than 40 million Americans. Other awards ceremonies (such as the Emmys, Golden Globes, and Grammys) are broadcast live in the Eastern & Central time zones, but are on tape delay on the West Coast and might not air the same day outside North America (if the awards are even televised). The Academy has for several years claimed that the award show has up to a billion viewers internationally, but this has so far not been confirmed by any independent sources. The Awards show was first televised in 1953, on NBC, which continued to broadcast the event until 1960 when the ABC Network took over, televising the festivities (including the first color broadcast of the event in 1966) through 1970, after which NBC resumed the broadcasts. ABC once again took over broadcast duties in 1976 and it is under contract to do so through the year 2020. The first countries to broadcast the Academy Awards on television, aside from the United States, were Canada, the United Kingdom and Mexico; the latter two countries did not broadcast the live show, and Mexico did not carry the live event until 1964. By 1954, seven other countries, namely Brazil, Cuba, Venezuela, West Germany, Belgium, the Netherlands and France, were already broadcasting the Awards show, although previously filmed into a condensed 60-minute version, called the "International Edition" of the Academy Awards. The Awards show was broadcast for the first time via satellite in 1970, but only two South American countries, Chile and Brazil purchased the rights to air the live event. By that time, the television rights to the Awards show were sold in 50 countries. A decade later, the TV rights to the Oscars were already being sold to 60 countries, and by 1984, the TV rights to the Awards were licensed in 76 countries. Until the arrival of subscription television in Europe, Africa and the Middle East, which enabled the Oscars to be broadcast live through these territories, there was already available a previously filmed or taped 90-minute version of the Awards show which was aired on broadcast television in these territories. However, several Asian and Australasian countries, such as Japan, Hong Kong, South Korea, Singapore, Malaysia, Australia and New Zealand were already carrying the live broadcast of the Awards show since the late 1970s. AMPAS still produces a condensed 90-minute version of the Academy Awards for those territories in which the rights to the live broadcast are expensive. The major awards are presented at a live televised ceremony, most commonly in late February or early March following the relevant calendar year, and six weeks after the announcement of the nominees. It is the culmination of the film awards season, which usually begins during November or December of the previous year. This is an elaborate extravaganza, with the invited guests walking up the red carpet in the creations of the most prominent fashion designers of the day. Black tie dress is the most common outfit for men, although fashion may dictate not wearing a bow-tie, and musical performers sometimes do not adhere to this. (The artists who recorded the nominees for Best Original Song quite often perform those songs live at the awards ceremony, and the fact that they are performing is often used to promote the television broadcast). Film companies will spend as much as several million dollars on marketing to awards voters for a movie in the running for Best Picture, in attempts to improve chances of receiving Oscars and other movie awards conferred in Oscar season. The Academy enforces rules to limit overt campaigning by its members so as to try to eliminate excesses and prevent the process from becoming undignified. It has an awards czar on staff who advises members on allowed practices and levies penalties on offenders. For example, a producer of the 2010 Best Picture nominee, The Hurt Locker, was disqualified as a producer in the category when he contacted associates urging them to vote for his film and not another that was seen as front-runner (The Hurt Locker eventually won). The winners are then determined by a second round of voting in which all members are then allowed to vote in most categories, including Best Picture. In late December ballots and copies of the Reminder List of Eligible Releases are mailed to around 6,000 active members. For most categories, members from each of the branches vote to determine the nominees only in their respective categories (i.e. only directors vote for directors, writers for writers, actors for actors, etc.). In all major categories, voters use an instant run-off voting ballot, with potential nominees rewarded in the single transferable vote tally for having strong supporters who rank them first. There are some exceptions in the case of certain categories, like Foreign Film, Documentary and Animated Feature Film, in which movies are selected by special screening committees made up of members from all branches. In the special case of Best Picture, all voting members are eligible to select the nominees for that category. Foreign films must include English subtitles, and each country can submit only one film per year. Rule 2 states that a film must be feature-length, defined as a minimum of 40 minutes, except for short subject awards, and it must exist either on a 35 mm or 70 mm film print or in 24 frame/s or 48 frame/s progressive scan digital cinema format with a minimum projector resolution of 2048 by 1080 pixels. According to Rules 2 and 3 of the official Academy Awards Rules, a film must open in the previous calendar year, from midnight at the start of 1 January to midnight at the end of 31 December, in Los Angeles County, California and play for seven consecutive days, to qualify (except for the Best Foreign Language Film). For example, the 2009 Best Picture winner, The Hurt Locker, was actually first released in 2008, but did not qualify for the 2008 awards as it did not play its Oscar-qualifying run in Los Angeles until mid-2009, thus qualifying for the 2009 awards. In May 2011, the Academy sent a letter advising its 6,000 or so voting members that an online system for Oscar voting will be implemented in 2013. All AMPAS members must be invited to join by the Board of Governors, on behalf of Academy Branch Executive Committees. Membership eligibility may be achieved by a competitive nomination or a member may submit a name based on other significant contribution to the field of motion pictures. Academy membership is divided into different branches, with each representing a different discipline in film production. Actors constitute the largest voting bloc, numbering 1,311 members (22 percent) of the Academy's composition. Votes have been certified by the auditing firm PricewaterhouseCoopers (and its predecessor Price Waterhouse) for the past 73 annual awards ceremonies. The Academy of Motion Picture Arts and Sciences (AMPAS), a professional honorary organization, maintains a voting membership of 5,783 as of 2012. Since 2004, Academy Award nomination results have been announced to the public in late January. Prior to that, the results were announced in early February. In 1992, Harold Russell needed money for his wife's medical expenses. In a controversial decision, he consigned his 1946 Oscar for Best Supporting Actor for "The Best Years of Our Lives" to Herman Darvick Autograph Auctions, and on August 6, 1992, in New York City, the Oscar sold to a private collector for $60,500. Russell defended his action, saying, "I don't know why anybody would be critical. My wife's health is much more important than sentimental reasons. The movie will be here, even if Oscar isn't." Harold Russell is the only Academy Award winning actor to ever sell an Oscar. Since 1950, the statuettes have been legally encumbered by the requirement that neither winners nor their heirs may sell the statuettes without first offering to sell them back to the Academy for US$1. If a winner refuses to agree to this stipulation, then the Academy keeps the statuette. Academy Awards not protected by this agreement have been sold in public auctions and private deals for six-figure sums. In December 2011, Orson Welles' 1941 Oscar for Citizen Kane (Best Original Screenplay) was put up for auction, after his heirs won a 2004 court decision contending that Welles did not sign any agreement to return the statue to the Academy. On December 20, 2011, it sold in an online auction for US$861,542. To prevent information identifying the Oscar winners from leaking ahead of the ceremony, Oscar statuettes presented at the ceremony have blank baseplates. Until 2010, winners were expected to return the statuettes to the Academy after the ceremony and wait several weeks to have inscriptions applied. Since 2010, winners have had the option of having engraved nameplates applied to their statuettes at an inscription-processing station at the Governor's Ball, a party held immediately after the Oscar ceremony. In 2010, the R.S. Owens company made 197 engraved nameplates ahead of the ceremony, bearing the names of every potential winner. The 175 or so nameplates for non-winning nominees were recycled afterwards. The origin of the name Oscar is disputed. One biography of Bette Davis claims that she named the Oscar after her first husband, band leader Harmon Oscar Nelson; one of the earliest mentions in print of the term Oscar dates back to a Time magazine article about the 1934 6th Academy Awards. Walt Disney is also quoted as thanking the Academy for his Oscar as early as 1932. Another claimed origin is that the Academy's Executive Secretary, Margaret Herrick, first saw the award in 1931 and made reference to the statuette's reminding her of her "Uncle Oscar" (a nickname for her cousin Oscar Pierce). Columnist Sidney Skolsky was present during Herrick's naming and seized the name in his byline, "Employees have affectionately dubbed their famous statuette 'Oscar'". 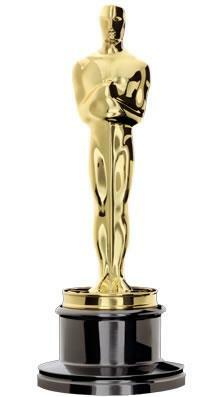 The trophy was officially dubbed the "Oscar" in 1939 by the Academy of Motion Picture Arts and Sciences. In support of the American effort in World War II, the statuettes were made of plaster and were traded in for gold ones after the war had ended.